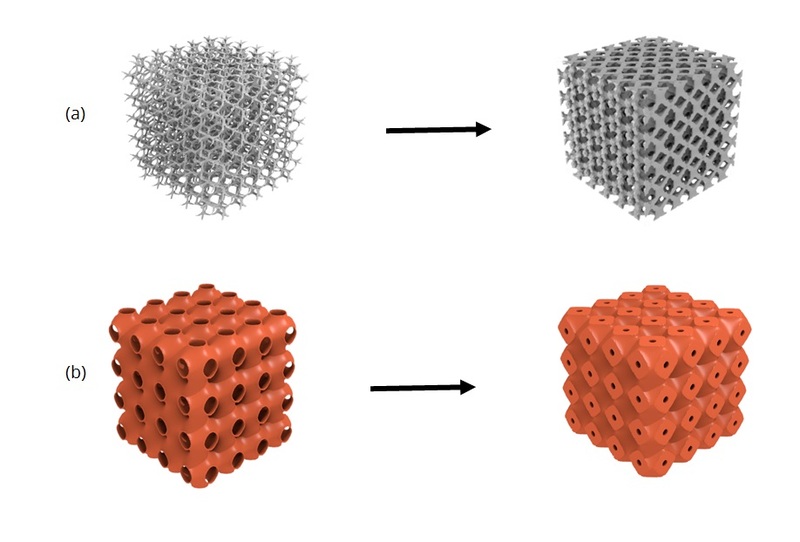 In this work, software originally designed for display rendering, artistic graphics, animation creating, and video game creation is being used to create new materials with tunable properties. This work has produced digital designs of materials that are essential to reducing sound and vibration. 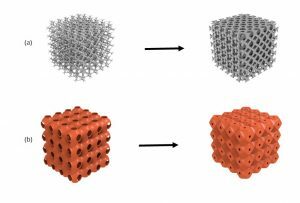 Metamaterials are specially engineered materials which use a combination of structure and host materials to enable a wide range of material properties not ordinarily found in nature. Metallic foams are one such subset of metamaterials, which provide advantages for structural applications due to their high strength-to-weight ratio. 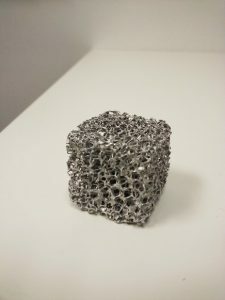 Metallic foams can be manufactured through a variety of processes, such as casting or sintering, and can either be closed cell or open cell (Figure 1). Figure 1. An open cell aluminum foam manufactured by ERG Aerospace Corp. The ability to tune metallic foam properties for various noise and vibration mitigation applications is a valuable tool for industrial designers and engineers. 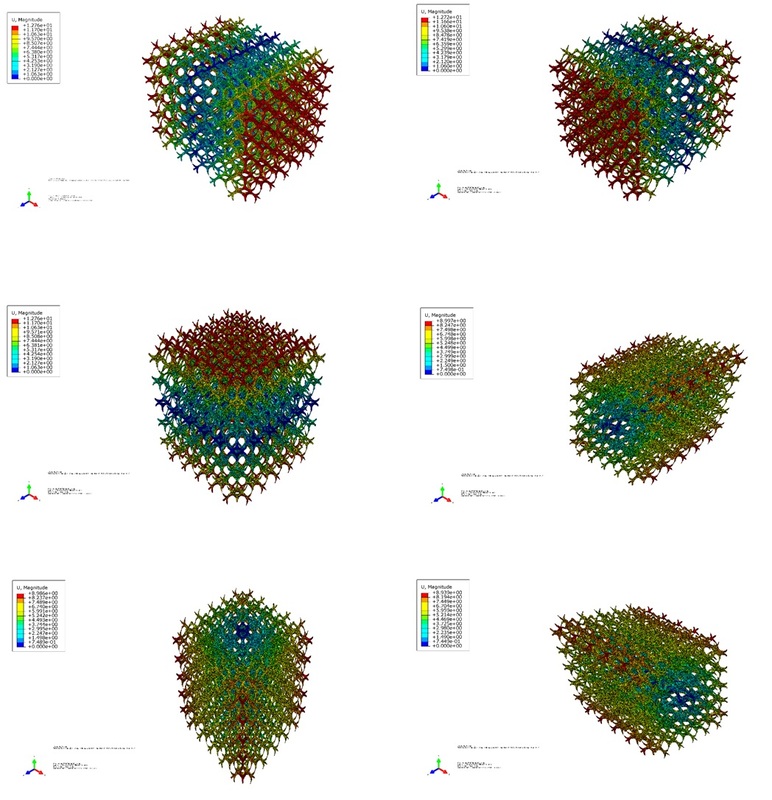 The combination of 3-D computer graphics and finite-element software can be used to rapidly design, investigate, and classify material properties. OpenGL is a programming language used widely in computer graphics. Using OpenGL, the programmer can create complex cellular structures by effectively controlling the pixel display in a 3-D array of pixels by using signed distance functions to specify locations of solid material or void space. One remarkable thing about using OpenGL is its inherent simplicity and ability to create any surface described mathematically. Two such materials, created from the described approach, are shown in Figure 2. Figure 2. (a) an Aluminum tetrahedron lattice with triangular struts. (b) A copper minimal surface geometry structure. The relative density of these two foams was altered by keeping the pore spacing (the distance between void openings in the surface) constant and increasing the thickness of material. To determine effective materials properties, the designed foam structures were analyzed using the finite element method software, Abaqus. Six different strain loading scenarios were imposed on the structure: representing tensile and shear loading on all orientations, shown in Figure 3. Figure 3. Strain loading scenarios used in determining effective material properties. We then determined numerically the effective static material properties, such as Young’s modulus and Poisson ratio. Figure 4 shows relative Young’s Modulus and Poisson ratio values vs. relative density for the foam in Figure 2b. Each blue point is one foam that was digitally designed and analyzed by the discussed approach. It is interesting to note that there is a very significant trend — properties are a quadratic function of relative density. Figure 4. Material property curves for the foam in Figure 2b. The useful feature about curves such as those in Figure 4, and others generated by the discussed approach, is the ability for designers to visualize the design space and availability of material properties and select a desired relative density foam to meet design criteria. Such foams can then be fabricated and implemented to serve a wide range of structural applications.